All I Have To Do Is Dream was written by Boudleaux Bryant, an American pop and country music songwriter born in Shellman, Georgia - 1920. The song was recorded by The Everly Brothers on March 6, 1958 ft. Chet Atkins on guitar, and released as a single in April, 1958. Easier: play in D Major - capo on 2 if playing with video. Capo on the 2nd Fret if playing with the video. Don Everly: Born in Brownie, Muhlenberg County, Kentucky, in 1937. Phil Everly: Born in Chicago, Illinois in 1939. Died on January 3, 2014. 35 Billboard Top 100 singles, 26 of which were in the top 40. Hold the record for the most Top-100 singles by any duo. 1986 - among the first 10 artists inducted into the Rock and Roll Hall of Fame. Oct 2, 1986 - received a star on the Hollywood Walk of Fame for their work in the music industry. 1997 - awarded the Grammy Lifetime Achievement Award. 2001 - inducted into the Country Music Hall of Fame. 2004 - inducted into the Vocal Group Hall of Fame. 2004 - Rolling Stone Magazine ranked them No. 33 on its list of 100 greatest artists of all time . Ranked No. 43 on the list of UK Best selling singles artists of all time . 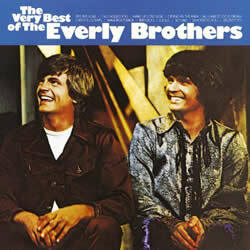 Everly Brothers chords and lyrics are property and copyright of their owners. "All I Have To Do Is Dream" chords and lyrics are provided for educational purposes and personal use only.